We ask all skaters show up 15 minutes earlier to be ready for class. Only $20.00 Per Child for the Whole Month! *Must arrive prior to 10:15 am for the Class Program. Private lessons are available and more advance classes are available, see skating instructors for further info. Please fill out the below information for the person of contact. This information is required in case we need to contact you in regards to cancellations or any information regarding skating classes. By checking this box I consent the use of this information being used by Illini Skateland at their discretion. 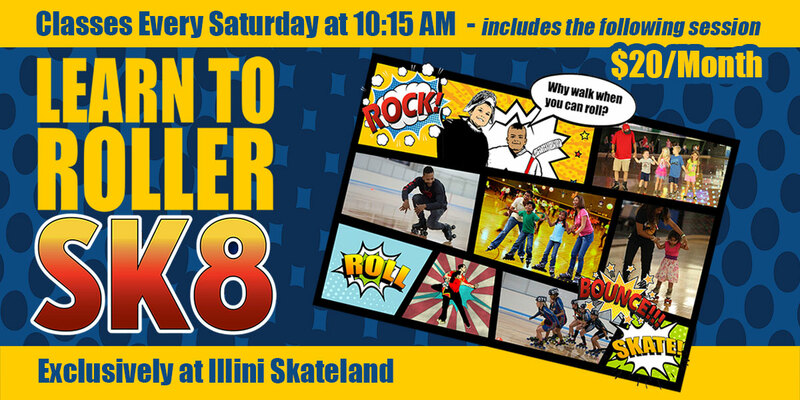 This information will not be sold to any third parties it is for Illini Skateland’s personal records. Also by checkboxing are granting Illini Skateland consent to use photos of yourself and the people whom you registered for use by Illini Skateland.